1. Pulse almond flour and powdered sugar in a food processor until very finely ground. Be careful not to grind too long, because it will release all of the oils, ruining your final product. 2. Sift the powder with a medium-mesh sieve. 3. Place the particles that are too large to fit through the sieve back into the food processor, pulse, and sift again. Throw out the excess pieces. 4. In a grease-free bowl, place your egg whites and sugar. Allow to sit for a few minutes to begin to dissolve. 5. Use grease-free beaters on high speed to whip the egg whites to stiff peaks. 6. Use a rubber spatula to fold the dry ingredients into the meringue until the batter moves slowly, like lava. If you run your spatula through it, it should fall together after 5-7 seconds. 7. Put the mixture into a piping bag fitted with a large round tip (3/8 inch). 8. Pipe rounds that are about an inch apart onto a nonstick baking mat (silpat) that is placed onto a cookie sheet. 9. Do this by holding the bag straight up about half an inch above the silpat, applying pressure to the bag until about 1 inch in diameter, stopping pressure, and then removing by moving hand in a very small circular motion to release the tip from the macaron shell. Make sure there is enough space to spread. 10. Rap your cookie sheet/sheet pan on the table a few times to make sure there are no bumps on the macaron shells. 11. Before they dry, lightly sprinkle the shells with dried orange peel. 12. Let rest until dry to the touch (about 30-45 minutes, longer on rainy days). 13. Preheat oven to 300 degrees F. If you have a convection oven, use convection. 14. Bake macaron shells on the second shelf of the oven for 14-17 minutes, until they do not wiggle when nudged. 15. Remove from oven and allow shells to cool completely before removing from the silpat. 1. Place chocolate into a bowl. 2. Heat the heavy cream until it boils. 3. Pour the hot cream over the chocolate. Gently stir until combined. 4. Add the zest to the ganache and mix to incorporate. 5. Cover the ganache with a piece of plastic wrap. Allow the wrap to touch the surface of the ganache so a film does not develop. 6. Allow to cool to room temperature before using. 1. Whisk together mandarin syrup and gelatin powder. 2. Allow the gelatin to bloom for 5 minutes. 3. Head the gel in the microwave until it is melted. 4. In the meantime, crush the segments in a bowl. 5. Pour melted gel into the bowl with the crushed segments and mix. 6. Then, pour the orange gel into a flat loaf pan or plastic container so that it creates a thin layer (1/4 inch). 7. Place into the fridge to set. 8. 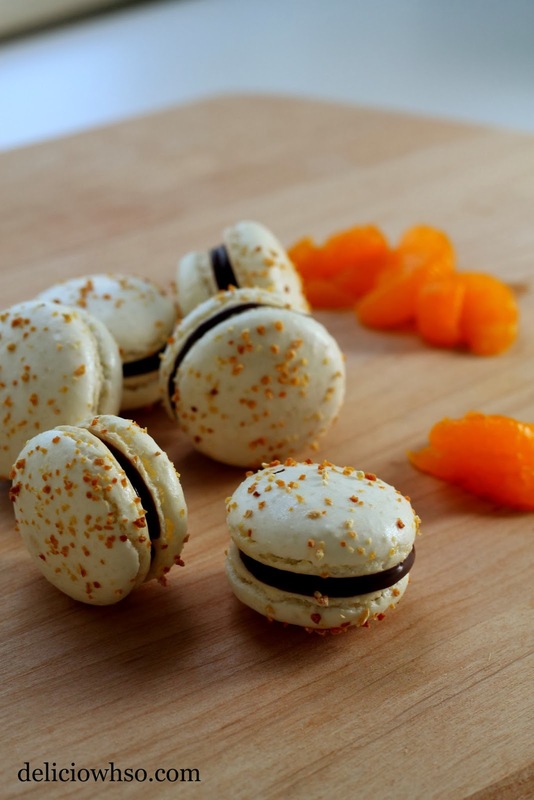 When the gel has set, use a paring knife to cut 1/4" squares to place in the center of each macaron. 1. Pair the shells by size. You should have about 20 pairs of shells. 2. Put the ganache into a piping bag with the same tip that you used to pipe the macarons. 3. Pipe the ganache so that it is covering about 3/4 of the surface of the bottom of the shell. Place a piece of the gel into the center. 4. Put the pairs together to create a "sandwich". 5. Place in the fridge overnight to allow the flavors to develop. 6. Let the macarons come to room temperature before you serve them. 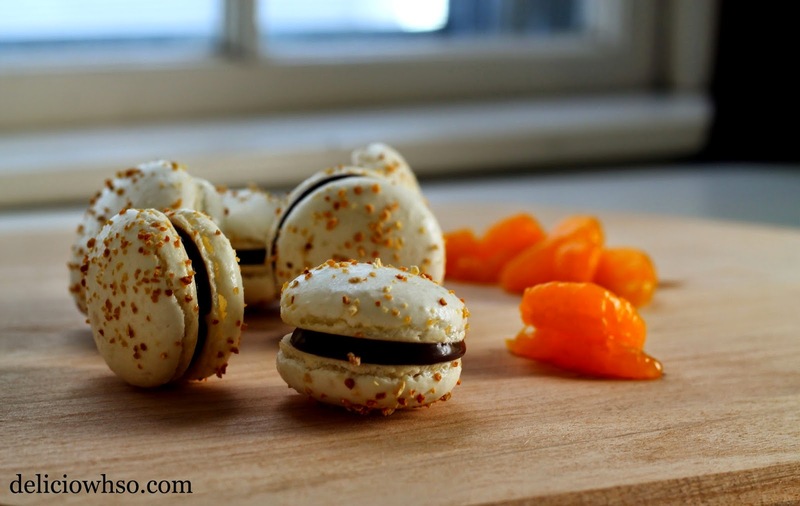 Try making these exciting, interesting macarons at home! Leave comments with any flavor suggestions and results! Chocolate Orange Macarons is good to eat. People who like this desert will read this blog. I use to eat sweets while my https://www.essaywritinglab.co.uk/assignment/ work. This is always the best idea for all of us to present some good points to others.